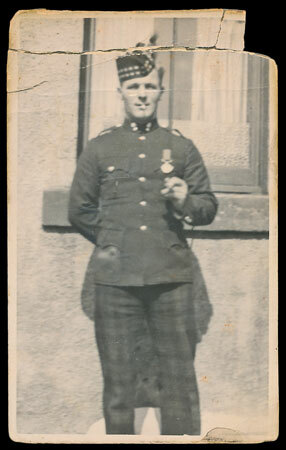 A scarce 1936 Military Medal group to Pte Thomas Kelly 1st Battalion Royal Scots Fusiliers is offered in our 17th October 2018 medal auction with an estimate of £2,000. 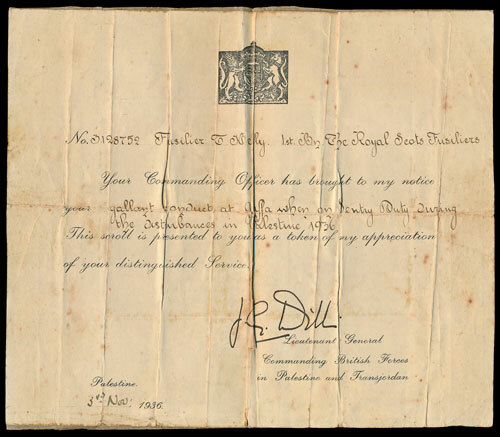 Pte Kelly received a GOC’s certificate of appreciation signed by Lieutenant General Dill, Commanding British Forces in Palestine and Transjordan dated 3rd November 1936 which states Fusilier Kelly’s CO had brought him to his notice for, “your gallant conduct at Jaffa when on sentry duty during the disturbances in Palestine 1936”. It is thought this action may have resulted in the award of the Military Medal which was announced in the London Gazette dated 6th November 1936. Only 5 MMs were awarded to the Royal Scots Fusiliers between the wars. During WW2 he was taken Prisoner of War by the Germans on 26th May 1940 during the fighting around the Ypres-Comines canal and spent the rest of the war behind the wire. Only about 250 men of the battalion escaped back to England via Dunkirk. Pte Kelly’s full group is 1936 Palestine Military Medal, 1923 GSM Palestine clasp, WW2 1939-1945 Star and BWM to 3128752 Fus T. Kelly R.S.F.